Ahhh yes, time is definitely a major barrier to reaching your health and fitness goals as a new mom. The few minutes you do have to spare for yourself are thinly spread between grabbing a bite to eat, heating up your coffee for the one-hundredth time or maybe even doing the unthinkable and resting. This constant juggling act can be exhausting. However, I am here to tell you, and most importantly show you, that as little as 10-15 minutes a day can give you huge benefits both mentally and physically. But guess what? Nowhere in these guidelines does it specify a recommended duration for each exercise session. In fact, it is even stated that several 10-15 minutes sessions spread throughout the day or week can reap the same benefits as longer workout sessions. There were MANY times where the only way I could get my workouts in was with one baby strapped to my body and the other one playing next to me or joining in on my workout. I often grabbed my loop bands and dumbbells and got creative with some exercises while I walked the girls. By doing things like lunges, squats and burpees instead of just walking. Yes, it can be a little embarrassing but so is feeling insecure in your body. Still not convinced you have time? Thats okay, I was skeptical too so I did a little research and wrote about it here. I also wrote a few 10-15 minute workouts to help you burn some calories. Also be sure to join our community to be the first to hear about my new “Tone in 10” Fitness program. Remember when I mentioned above that I feel perpetually exhausted? Believe it or not, this state of exhausting actually motivates me to workout. Before you think I have completely lost my mind in this state of exhaustion, here me out. ›The more you move, the more your body wants to move. ›The more you rest, the more your body wants to rest. Any amount of physical activity or exercise that raises your heart rate, increases blood flow and releases endorphins will also raise your energy levels. I love endorphins! Not only boost your mood, but also your energy levels. Exercise also helps improve sleep and therefore, giving you more energy throughout your day to exercise and keep up with your never ending todo list. See how everything ties together here? I get asked often if I use any pre-workouts for energy. The only two things I drink are good ol’ coffee and an all natural energy drink. Not only does it help increase my energy, but it also helps with my focus which is a must through this exhaustion. Have I overused the word “exhaustion” yet? I must be exhausted! More often than not, exercise and weight loss requires a greater motivation than simply wanting to “look better” or “lose weight“. In order to light that fire under our booties, we need to find a motivation aside from the weight loss and appearance. Personally, my kids have been my biggest motivation to stay fit and healthy. Sure, I have been passionate about health and fitness the majority of my life. However, it wasn’t until I had kids that I truly saw the importance of taking care of both my mental and physical health. I never want my kids to be disappointed because I’m out of shape and can’t chase them around at the park. I also want to have more patience and tolerance of their craziness, fussiness and stubbornness. Exercise really helps with these things by reducing my anxiety and boosting mood and energy. Life is stressful, even for kids, and I personally feel that keeping kids active can help build strength and cofidnece to tackle this crazy life. I also want my kids to learn the importance of staying active and healthy as well as grow to value the importance of taking care of their mental and physical wellbeing. If you’re struggling with finding motivation to workout, take a moment to think of some reasons outside of just wanting to look better or lose weight. I want more energy to keep up with the demands of family, careers, children, marriage, etc. I want to feel less stressed, have more patience, and improve my mood. I truly believe that support is the number one most important element of any goal. If we don’t feel supported, then we can lose motivation when times get tough. Asking for help or support as a mom is so hard. We feel like we should be the ones supporting and helping everyone else. But that old saying, “If mama ain’t happy, ain’t nobody happy” is very true. If someone gives you a hard time for working out or eating healthy, don’t be afraid to stand up for yourself. There is nothing embarrassing about wanting to take care of your physical and mental wellbeing. Sometimes even our own spouses can be unsupportive. This is where communication is crucial. Try asking them if they want to join you in some workouts or learning new recipes. Including your spouse in your fitness or weight loss goals can help them be more supportive. The more support you have, the better! As for me, my number one goal is to help support you. If you need more encouragement or even a pep talk, be sure to join our “Struggles of a Fit Mom” community on Facebook or Instagram. I hate to break it to you but mom guilt is something that will never go away. I often find myself feeling guilty over every little thing, working out is no exception. However, and this is just me personally, I would rather feel guilty for taking a little time for myself to workout than feel guilty for not having the energy or patience to keep up with my busy little girls. If you feel guilty for leaving your babies to workout, try doing some workouts to include them or throw in some exercises while they play. Not only will you be getting your workout in but you are also teaching your kids the importance of staying active and healthy! 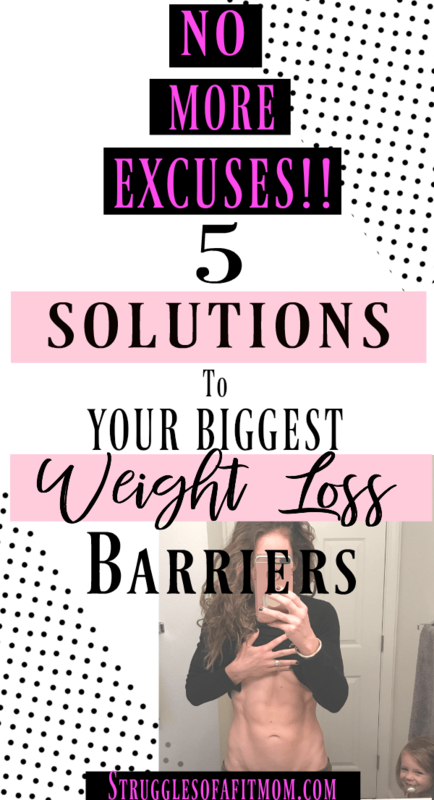 My top 5 tips to help you overcome the most common barriers to reaching your weight loss and fitness goals. The demands of motherhood is often greater than we give ourselves credit for. We sacrifice a lot for our families but our health, both mental and physical, should not be one of them. I don’t make many promises but I can promise you that no one is perfect. The most important thing to remember is that consistency is going to give you the greatest results! What are your most common barriers to reaching your health and fitness goals?